Medium Balance Board Combo for Functional Training, Core Strength, Posture Control and Fitness. Multi-Directional Free Rotation On A Solid Ball. Perfect combo to develop speed and strength. This popular sized board fits just about everybody and has enough space for a comfortable upper body workout. Full body moves are fun and will challenge you to stay steady in a tight space. You can quickly kick this board around but feel the weight challenge your strength at the same time. The Freestyle Original board brings the beauty of movement and athleticism to you. Express your ride style with smooth controlled turns, graceful momentum transfers or pure powerful ambition. Either take it slow and steady or fire up your muscles and set yourself apart. 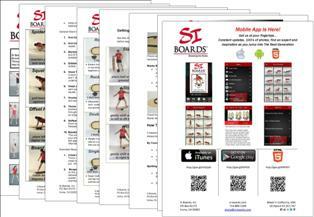 Our most popular board size fits a variety of ride stances and is comfortable for upper exercises. Transitions between moves are easy and let you master new skills without overtiring your legs. A great medium board that is fast, fun and strength challenging at the same time. With a large rail space there is plenty of room for 2 balls or half balls for full body moves. 6.5" Medium ball provides the best combo of board tilt and ride space. Keeping you off the ground for big flowing turns and upper body coordination. This ball rides very graceful and lets you hang for stability or will respond to your every move. 5" Small balls are perfect when creating the double pivot. Place both balls under the board to practice full body move and one foot balance. Place the 5" ball with the 8.5" Half Ball and create a single pivot board. 8.5" Half Balls are perfect sizes for plenty of movement for your rocker and wobble board. Place one or two Half Balls under the board for complex upper body moves while stimulating your balance. Create your own unique combo that suits your needs. Add balls and half balls for variety. Featuring a steel rail system allow Resistance Bands to be attached and change up your exercise routine. Medium rail: 28" x 14" x 1"
Thank you for the recent great service experience. I ordered the Si board and accessories on a Friday, and the merchandise arrived by Monday. It's so fun and challenging! Looking forward to taking my balance and fitness to the next level. I love riding this combination of board and ball. I've gained a level of mastery here that is very satisfying. I stand 5'-10.5" in my bare feet and this suits me well. I can shove the board all over at good speed, then work strength by moving as slowly as possible in all stances. The workout is rewarding both in the effort, reward, and sheer pleasure of doing something insanely difficult and fun (I've been riding balance boards for years and these will push you like no other).